Don't take things personally. Separate what is said or suggested from the person who said it. 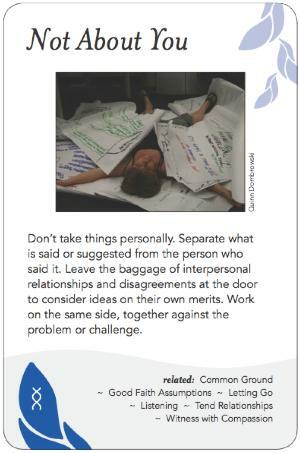 Leave the baggage of interpersonal relationships and disagreements at the door to consider ideas on their own merits. Work on the same side, together against the problem or challenge. Often when an issue or a proposal is brought to a group, reactions are coloured by impressions of the individual or members bringing it forward. In order for the group to cleanly discuss the issue/proposal, it is important to separate feelings, history and impressions of the people involved from the issue at hand. Similarly there is sometimes a pull to take sides in a discussion based on affiliation rather than individual perspective: the feeling that "Jane deserves my support on this", rather than "I agree with the point Jane is making". For example, let's say a group is discussing the annual budget and Lee suggests increasing the contingency line. From that point on, if the leader and participants refer to that as "Lee's idea," then people are likely to respond to it based on their relationship with Lee or Lee's status in the group. Thus in order to help make a separation and evaluate the idea on its merits rather than personality, it's usually better to refer to proposals in neutral terms, e.g. "the proposal to raise the contingency item." In long-term groups, people tend to get identified in certain political camps and it may be important for moving forward to shake up people's assumptions about each other. One way of doing this used by the Public Conversation Project is to bring out more of the complexity of each camp, for example by inviting people to share ways they don't fit the "party line." Personalized content can either add or detract from impressions of a proposal. For example, a member with very high or low social capital might have the same proposal received by their organization in very different ways. Often starting a movement towards a proposal from a community conversation allows the final contents to be depersonalized. Periodically naming that those moving forward with a proposal are carrying that energy for the group can help create a depersonalized frame. Also refer to proposals by their contents, rather than saying "Jane's proposal." Simply listing ideas on a board in brainstorming without including names can help. "Card-storming," that is, writing down the ideas on pages that are then compiled on the board at the front, has been shown to generate even more creative ideas than classic out loud brainstorming, because it makes more real the brainstorming guideline of nonjudgment. Other forms of anonymity in processes such as having everyone close their eyes during a straw poll raising of hands, or the use of a "shelter scale," can help members follow their heart rather than their social obligations or biases. When deciding when to apply Depersonalization, try to discern whether in fact a given issue is inherently about the persons involved. In such cases, naming rather than depersonalization may be the best course. At Quayside Village and WindSong Cohousing it was noted that the the common pattern was to bring fully formed proposals to the community. Tree Bressen pointed out in workshop with the communities that starting from a community conversation allowed more group ownership, thereby depersonalizing the resultant proposal. At a large scale, what if depersonalization were active in political dialogue around the liberal/conservative perspectives regarding solutions to environmental, social and economic issues. On a small scale, the brief interaction with a sales clerk when the till tape runs out and you are trying to catch a bus...depersonalization gives you more choice about how to respond to that. Something on "Six Hats" exercise? Teachings around the Buddist principle that attachment (a form of personalization) is the cause of suffering, which can be relieved by choosing to depersonalize the situation, and let go of attachment. Quote: Buddhist quote (Pali Canon?) around not believing something just because he said it.